Put the lime juice, rum and icing sugar into a bowl and whisk until the sugar has dissolved. Stir in the water, lime zest and mint. Pour into an airtight container and freeze overnight. Due to the alcohol content this sorbet sets softly, so use it quickly. Preheat the oven to 170°C/gas 5. Butter a large baking tin (approximately 24cm x 18cm) and line it with non-stick baking paper. In a large bowl or using a stand mixer, beat the butter and sugar together until light and fluffy. Add the eggs one at a time – the mixture may start to look split, but don’t worry. Add the flour, coconut, lime juice and zest and fold gently until you have a smooth batter. Pour the mixture into your baking tray and smooth the surface with a spatula or the back of a spoon, then bake for about 20 minutes, until the cake is golden and springs back when pressed. Run a knife around the edge of the tin, turn the cake on to a cooling rack and leave to cool completely. Once completely cool, cut out 8cm diameter circles from your sponge. We’ve used a cookie cutter, but a knife around a tumbler is fine. 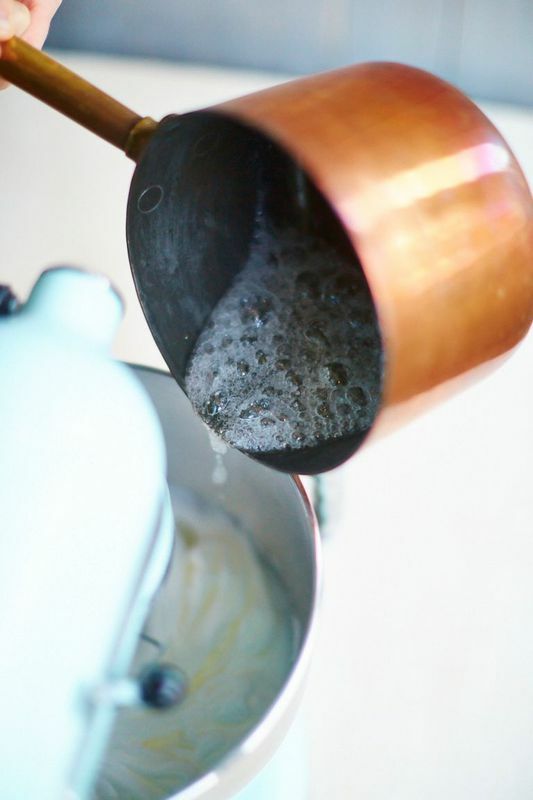 Put the egg whites and 1 tablespoon of the caster sugar into the bowl of a stand mixer, fitted with the whisk attachment, or use a clean glass bowl with a hand-held whisk. Don’t start whisking yet. Put the remaining caster sugar, light brown sugar and water into a heavy-based saucepan and place over a medium/high heat. (Don’t stir, as this can cause the sugar to crystallize and you’ll get crunchy bits in your meringue!). Once the sugar has dissolved and the mixture is boiling, attach a sugar thermometer to the pan and continue to boil without stirring until the syrup reaches 120°C. Then take the pan off the heat. Now turn the mixer on to high speed and whisk the egg whites until stiff peaks form. Reduce the speed to low and carefully pour in the hot sugar syrup in a very slow steady stream. Be careful to add the syrup directly to the egg whites, without it touching the side of the bowl or the whisk on the way down, otherwise it will cool before it hits the eggs. Once all the syrup has been added, turn the mixer on to high speed and keep mixing until the sides of the bowl feel cool. Place your four sponge circles in your desired serving dish. Using an ice cream scoop, place a perfect scoop of mojito sorbet on each sponge circle. Working quickly, cover the sorbet and sponge with Italian meringue – a mini palette knife is useful here. Blowtorch to a golden caramel colour and serve immediately with a cocktail umbrella.